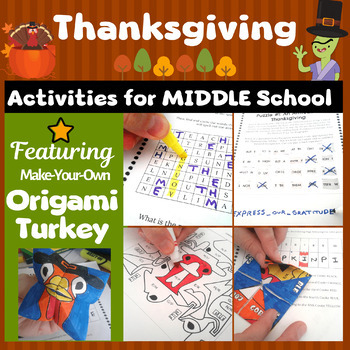 It's more than just a turkey in disguise, a Thanksgiving escape room, a breakout, a color by number activity, a cootie-catcher -- it's a team-building journey for your students that requires almost no prep from you! It all starts with reconstructing a powerful quote from John F. Kennedy on giving thanks: "As we express our gratitude, we must never forget that the highest appreciation is not to utter words, but to live by them." 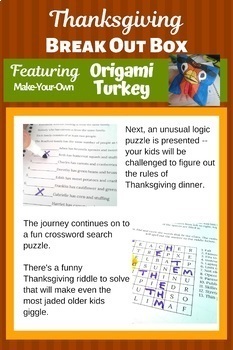 Next, an unusual logic puzzle is presented -- your kids will be challenged to read carefully to figure out the rules of Thanksgiving dinner. The journey continues on to a fun crossword search puzzle -- students solve crossword-style clues to find the answers in a word search grid. There's a funny Thanksgiving riddle to solve that will make even the most jaded older kids giggle. And finally, there's the prize -- the lovely, lovely prize. 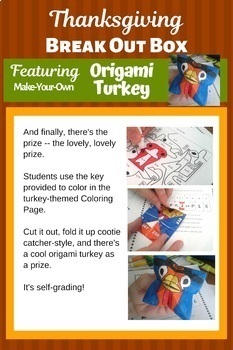 Based on their answers to the other puzzles, students use the key provided to color in the turkey-themed Coloring Page. 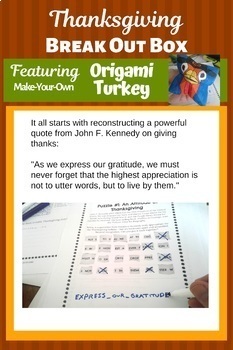 Cut it out, fold it up cootie catcher-style (instructions with diagrams provided), and there's a cool origami turkey as a prize. It's self-grading! If the students did not solve the other puzzles correctly, the coloring of the turkey will be clearly incorrect. And it's not obvious beforehand how to color the turkey - it may LOOK obvious, but it is not! It's a disguised turkey! All of the answers are included, even a properly colored-in turkey. All you have to provide is markers or colored pencils and scissors. No physical locks or Google forms required! Use in small groups for team-building. Kids can even do the puzzles independently. Teaches logic, vocabulary, ELA, social studies, and perseverance. And if your kids enjoyed this activity, try our new Christmas make-your-own silly green elf activity!